Through visual, digital, and performing arts, PCDS students regularly explore their creative sides, think outside of the proverbial box, and grow in their own methods of self-expression. Every student, regardless of age or skill level, thrives when ideating, revising, and producing new and original works of art, music, or performance. The result was one of the most enjoyable and well-attended fall plays in PCDS history. 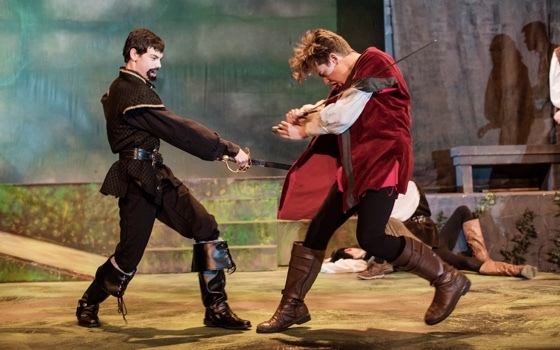 Robin Hood also represented another landmark: It was the 25th PCDS production under the direction of Mr. Keith Burns. “I just love it, and I love the kids,” he smiled. And, Mr. Burns had plenty of student help, too: Senior Sally Tepper served as stage manager for the fourth year in a row, and this production featured another first: Senior Bianca Portovi served as the first-ever student costume designer for the play. Congratulations to the cast and crew! For over thirty years, Mr. Rowe has been inspiring his Jazz Band students to experience to what he refers as that exhilarating, heady feeling of when music just comes together. He certainly knows the feeling well, since he himself is a professional musician, holding positions of music director, handbell choir director, and organist outside of school. With an instructional style that is as equally loving as built on high expectations, Mr. Rowe instills within his students a commitment to their practice and love for jazz music. Mr. Rowe’s Jazz Band year after year consistently develops a rapport akin to no other. He compares his student groups to birds, making beautiful music together as they continually learn and develop concepts handed down from former generations. One of the highlights for Mr. Rowe’s Jazz Band students is when the group earns the privilege of traveling to New Orleans to play their music on the streets, which typically attracts large crowds. 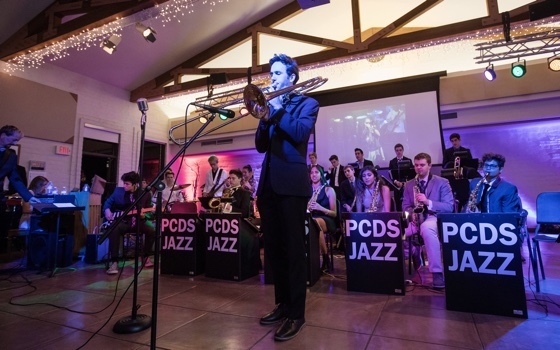 PCDS Jazz Band ensembles, after having achieved the standard necessary to perform effectively on the streets of New Orleans, have traveled to New Orleans for the French Quarter Festival. When the New Orleans trip is offered, which is typically every few years, it is for members of the "40th Street Jazz Club.” The name for the program was derived from the inception of the 40th Street Jazz Club concert years ago, which has since become a wildly popular event. One Jazz Band even went to New Orleans immediately following Hurricane Katrina and hosted "Jazz on the Bayou,” a benefit concert for those in need. Additionally, the group that year delivered a truckload of instruments to residents of New Orleans. Now that is exhilarating. The artists that have most inspired Ms. Tolentino are those who ask questions that go beyond mastery of skill, craft, or self-expression, those with a relentless commitment to asking hard questions about social and environmental systems, human existence, spirituality, and compassion. Her interdisciplinary approach is based on the premise that different people learn, care, and latch on to things differently. By offering multiple ways of experiencing the same material – be it math or art, these different ways of learning and being are respected. Each of Ms. Tolentino’s classes consists of processes that are grounded in design thinking, but with different outcomes. For example, Coding as Art I teaches students how to think computationally by analyzing, recreating, and generating original visual designs, animations and textile patterns. 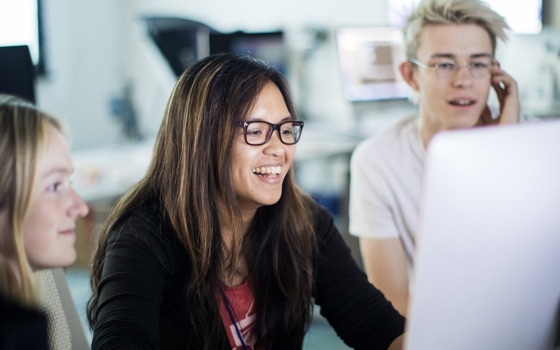 Coding as Art II gives students more advanced tools to create physics simulations, video games, and interactive possibilities that involve multiple computers or other elements like sound or motion sensing. Game Design teaches students how to analyze games from their technical and aesthetic qualities, as well as the social dynamics they produce when people put rules into play; once they have learned how these systems work, they build their own game, meanwhile examining systems that exist in society (e.g., methods of control, stereotypes, implicit games people play) to understand the hidden or implicit rules. In Interactive Spaces: Physical Computing and Installation Art, students manage a long-term project proposal, timeline and budget for a large-scale, interactive piece, and meanwhile make interdisciplinary connections between design, engineering, art, and psychology, through team-based projects and in-depth analysis of works in the field. Ms. Tolentino’s philosophy regarding arts education is to bring young people as close to a true contemporary practice as possible. That means allowing them to be creators of something new or novel, and that there will be no clear guide or "how-to" manual; they learn as they go. While this can be very uncomfortable place for students, Ms. Tolentino supports their development of comfort and patience with unknowable spaces or seemingly impossible goals; because this is the place where she believes all creators - artists, architects, designers, and engineers – live; at some point, what is not known becomes known, but it takes constant work and patience. Ms. Tolentino teaches her students to learn to love the process of being resolved, adaptable, relentless, and reflective. This will get them to resilience, a skill that transfers far beyond the practice of arts. Ms. Tolentino empowers her students to choose ideas, paths, and solutions that make sense for them.